Rich: He runs the popular blogging podcast, mywifequitherjob.com, where he documents and teaches others how to run a profitable e-commerce business. He also runs an online store with his wife at bumblebeelinens.com, an annual conference called The Seller’s Summit, and email list growth service called goranwind,com, and a brand new Shark Tank-like show called 5 Minute Pitch. 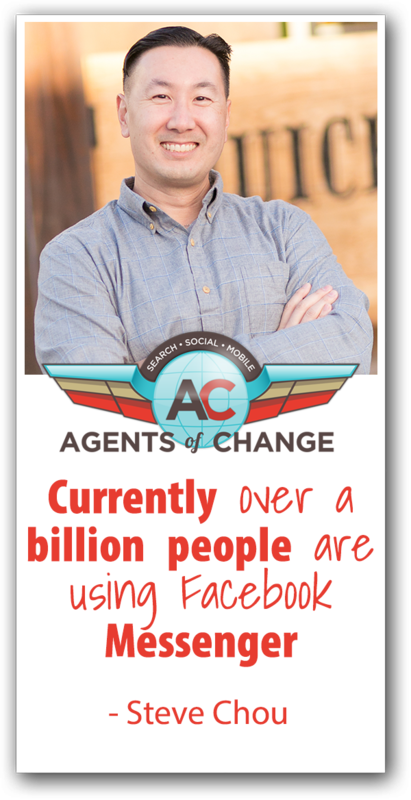 Back for a second go around on The Agents of Change Podcast, Steve Chou. Steve, welcome back to the show. Steve: Happy to be back, Rich. Rich: I always enjoy your stuff. You’ve got a great dry sense of humor, I remember your presentation from Social Media Marketing World last year, and I notice that you’re speaking again this year, which is why I reached out to you. I was curious, let’s start with a little background. You’ve got an e-commerce store and you’re marketing through Facebook. Give me a brief overview of what you were doing on Facebook before you started using Messenger bots. What did that look like? Steve: Yeah, so I had email and my Facebook campaigns tied together. So for example on the e-commerce store perspective, whenever someone looked at a product but they didn’t check out, that audience was automatically exported over to Facebook where they would get an ad that would display exactly what they were looking at. I also had a free plus shipping offer that I was running. So my store sells handkerchiefs – just for the context of the listeners – and what we were doing there was we were giving away a free handkerchief and all you had to do was pay for shipping, which was $4.95. And the way that worked is I would drive someone from Facebook over to a landing page where I would try and grab an email, and then after they gave me an email I would present them the offer. And that actually put them on this auto responder sequence where I would try to upsell them similar products. Rich: Ok, and that’s for bumblebeelinens.com. Steve: That is for Bumblebee Linens, that is correct. Rich: Now you also teach e-commerce. Do you have some sort of membership group as well, if I remember correctly? Steve: I do, that is correct. That is over at profitableonlinestore.com. I actually forgot to include that in the bio that I sent you. Rich: And were you using Facebook advertising to get in front of targets for that business as well? Steve: That is correct. Yes, it’s a different type of ad. The way I run ads is different for the blog versus the online store. Rich: And how are they different, may I ask? Steve: Yeah. So with the blog when I’m trying to get someone to a webinar training or a class, I can actually afford to pay a whole lot more. And those ads I tend to run just from leads. So my breakeven point for the blog or to get someone on the webinar to join my class is around the area of $12 per lead. And my course costs $1,600. Whereas when I’m running ads for my e-commerce store the average order is $60. So I have to be a lot more precise and I have to go for a lot more granular targets that I know are going to convert in order to be successful. Rich: That makes sense. So that’s great that you have these two different products/services that you’re selling, so you understand both those high ticket items or the high profit items, as well as the stuff where the profit margin may be a little bit more narrow. Before we get further into this, you say “messenger bots”, other people say “chat bots”. Are they the same thing? Steve: To me they are. Rich: Ok. Is it different to other people? Steve: I actually don’t even use chat bots because to me that sounds impersonalized. I just call it Facebook Messenger bot. Rich: Ok, sounds good. So tell me a little bit what drew you to these Facebook Messenger marketing opportunities – which I may just call Facebook chat bots going forward – and how did you start using them? Steve: The reason I got attracted to them is actually my buddy Andrew Warner. I remember we were at Traffic & Conversion and he pulls me over and he shows me his open rates and some of these really cool automated flows that other e-commerce stores were using. And I don’t know how it’s been for you, Rich, but my email open rates I would say for the last 5 years it hasn’t been going up. It’s been going on this steady decline despite what I do. So I knew that in the long, long run that email would slowly start to decline, whereas here we have Messenger at the peak. It kind of reminded me of email when it first got started. So that’s when I started to jump on the bandwagon, and I’m calling it the next big thing until a whole bunch of marketers destroy the platform. Rich: I hope they don’t do that. First of all, what Messenger platform are you using, if you’re using any? Steve: So right now I’m actually using two platforms. One is called ManyChat, and that’s probably the one I use more for the blog, I guess. And for the e-commerce store I’m using a platform called ShopMessage, and there are reasons for that. So ManyChat is more like a generic Facebook Messenger platform. Where ShopMessage is very specific to e-commerce stores. Rich: What makes it specific to e-commerce stores? Because I know a number of our listeners may be running e-commerce stores and they’d be curious about that. Steve: So to give you an example with the e-commerce store, there’s push button flows to handle abandoned carts, win back campaigns, post purchase sequences, sending out the receipt and that sort of thing. So for example if someone comes on my store and if they hit “add to cart” and they don’t check out, they are given a Facebook message – I think I have it set to 4 hours later – where they’re given a message with a picture of exactly what they were looking at in my shopping cart with a push button to automatically go straight to checkout and complete the transaction. Rich: Ok, that sounds super interesting. Perhaps a little bit creepy, I’m not sure. But we are trying to make sales here. Do they need to sign up for anything, or is this using the Facebook pixel so you don’t need to worry about them taking the necessary steps? Steve: They do have to sign up. So right underneath my “add to cart” button it will say, “Would you like to get additional updates through Messenger?” And right now that’s actually a pre-checked box. I think that’s going to go away in the coming months. So as soon as they add something in the cart, as long as they don’t uncheck that box, they’re not a subscriber yet but I can message them at least once. Rich: That’s pretty powerful stuff. So somebody is in your e-commerce store, they drop something in their cart, this is pre-checked so unless they take an action against it. I’m guessing even if that changes you’ll come up with some sort of incentive – 10% off, free shipping – to get them to check that box regardless, and then all of a sudden you’re able to follow them back to Facebook if they get distracted or if they just stop doing what they’re doing, and you can continue to market them. Steve: That is correct. And actually I had to apply for that pre-check box a while ago. Prior to that when it was unchecked, I was giving away a free e-book. Actually, I didn’t call it an e-book, I said, “Hey, check this box and hit ‘add to cart’, and I’ll send you a special gift”, is how I phrased it. Rich: Nice. That makes a lot of sense. Alright, so you chose your platform, you’ve got two different ones. How are you getting people to initially engage with these Messenger tools? Is it through Facebooks Ads? You mentioned already that at the website you’ve got the checkbox. What are the different methods to get them into this Messenger bot, so to speak? Steve: So it’s a little different, I guess, between the two platforms. We can talk about e-commerce first. So I have a live chat widget there, and some of the most commonly asked questions I have are; where is my order, and how long is shipping. Rich: And are these on Facebook or are these on your website? Steve: These are on my website. It’s a live chat widget, so if you go on there you see it’s just like any other live chat except it’s run by Facebook. And so when someone clicks on that, I have the menu options, like “Would you like to check on your order?” And as soon as they click on that, they become a Messenger subscriber. Rich: It really is that easy to get people into that funnel. Steve: They just have to interact with you once. Now there is another way, which I implemented maybe a couple months ago, which I’ll talk about at the event. I have this popup form which is a Wheel of Fortune popup. Basically as soon as they enter in their email they have a chance to win free linens and free products from our shop, or discounts off our products. So as soon as they do that they spin this wheel and every slot on the wheel is a winner, and as soon as they win there is a link where if they click on it they are taken to Messenger in order to redeem the prize. So let’s say they win a 20% off coupon. They have to click on this link in order to redeem that prize, they are taken over to Messenger where the message is, “Are you here to redeem your coupon?” And as soon as they click ‘yes’, I give them the coupon and they instantly become a subscriber. Rich: And who created this Wheel of Fortune solution for you? Steve: I created the initial one, and then my partner saw what I did and just decided to add it to his platform. So the platform that I’m using is called Privy. Rich: Ok, that’s Privy, excellent. And then when you said you’ve got the Facebook Live chat on your site, is that through a third party service or is that something you set up yourself directly with Facebook? Steve: That is through ManyChat. Rich: That’s also though ManyChat, ok, cool. There’s a lot of different players in this, I’m just trying to keep them straight. Steve: It’s the wild, wild west right now. But ManyChat is a really good general purpose messenger platform. Rich: Alright, sounds good. Alright, so these are some ways that you’re getting people to engage with the bots. And it I’m understanding correctly, once they do anything with the bots, they basically opt in at this point. Rich: Ok, so one of the things that I understand about messenger bots is that there’s basically a flowchart that you create. Is that what happened here, where you sit down and kind of map out what the different question and answer things were going to be? I understand that the tool for the e-commerce messenger might be a little bit more complex, but on ManyChat is that kind of how it’s set up for you? Steve: Yeah. So if we’re talking about that live chat widget, I put in certain keywords for questions that customers are much more likely to ask, and if they just happen to fall under one of those keywords then I automatically output the answer. So that required a little bit of setup. In general, however, when I send out a broadcast to someone’s Messenger inbox, I try not to make that bot very elaborate because I’m trying to drive them to a specific page. Rich: Ok, so there’s the interaction that people might start on their own through whatever process we’ve discussed, and then there’s also once they’ve opted in to Messenger then you can broadcast in the same way you’d send out email newsletters. Steve: That’s right. That is correct, yes. Rich: And so with that you’re not really creating a flowchart. A flowchart is more when they’re coming into Messenger and engaging with your brand on Facebook, correct? Steve: That is correct, yes. Rich: Alright, sounds good. So what are some of the goals on the blog website that you’re using the bots? What are you trying to accomplish, what does that look like? Steve: Yeah. So for the blog it’s just getting people more exposed to my content. Also whenever I have a webinar or that sort of thing, Messenger is excellent for getting people to sign up. Rich: Alright, so you’ve got the webinar. I think I just need to go back. So, the blog is MyWifeQuitHerJob. And that blog is there in part just to educate people but also it serves as a funnel for your online courses and membership site, correct? Rich: So you’re then using Messenger to kind of promote the blog post and the webinars you’re doing on your MyWifeQuitHerJob brand, which ultimately will lead you to getting members for your organization. Rich: Alright, awesome. And what kind of open rates are you seeing right now? Like, are they that much better than your emails? Steve: Yes. They actually started out in the 80’s, they’ve since dropped a little bit to maybe around 60%, but still tremendously higher than email. Just to give you an idea of my email open rates, my most engaged emails get 45%-50%. Steve: No, but that’s just like the most engaged. I have them segmented. The next tier down gets around 20%. And then I have this really low tier that gets between 5%-8%. Rich: Do you mind me asking, a little off topic, how are you segmenting that? What tool are you using to segment your most engaged audience compared to least engaged audience? Steve: I use Drip. But it doesn’t matter what the platform is, the way I have it set up is my most engaged platform has opened an email in the last 4 weeks. My second tier is 8 weeks, and my last tier has opened an email within 16 weeks, I think. Rich: And you’re doing that on Drip, but I know that there are other platforms out there that are not that sophisticated, so that’s something I guess you can do on that platform – and maybe some others – but not necessarily all the ones out there. Steve: Interesting. I would say most platforms will allow you to do this. Rich: I think I need to investigate some more platforms is the problem. So you’re using Messenger also as a broadcast platform, we talked about that. How often are you sending out messages, and are you segmenting those type of messages as they go out? And feel free to split that answer into e-commerce versus membership site. Steve: Yes. So on the blog side there are primarily two types of interests. So my blog is very focused on e-commerce, and right now there are two main types of e-commerce that I cover. One, when you’re running your own online store. And the other one is selling on Amazon. So in terms of segmentation, when I send out an article that is either about Amazon or the online store, I have everyone tagged. So if they’re interested in this article I lumped them in the Amazon bucket. If they’re interested in a store article I lump them in the other bucket. And so when I have a new article that comes out I will tend to send to one or the other. However, when I’m giving a webinar I will send a blast to everyone. On the e-commerce store it’s a little bit trickier because I have people who are just interested in the content and the different product categories that I have. So whenever I run a sale I tend to send it to the people that are interested in that specific type of product, like handkerchiefs, napkins, or towels. Rich: Steve, this is fascinating. I love how dialed in you are to your audience and what they’re interested in and what their open rates are. How much tie would you say you invest on a weekly basis for segmentation? Steve: The segmentation is kind of automatic. It gets segmented on its own when I do broadcasts or when I acquire a customer. So all it is in ManyChat, you just drag a little box and you say “add a tag” when someone interacts with a button in your bot. It’s all in the setup, it’s not as much work after the fact. Rich: And so you’re using ManyChat, what was the name of the other one you’re using? Rich: And how many other platforms have you played around with, or has it primarily been these two? Steve: I played around with almost all of them. Because just by nature of running the blog, people will tend to give their tools to me for free. So I treat my store and my blog like a crash test dummy, so to speak. And so I’ve kind of played around with almost all the tools, related to e-commerce at least. Rich: If you start using one tool, how easy is it to move those audience members over to another tool, or are you starting from scratch? Steve: That’s a great question. In fact, I just recently asked that question to my buddy Larry Kim – he’s spoken at Social Media Marketing in the past – because he has his own platform called Mobile Monkey. They have figured out a way to move subscribers now, whereas that was not the case in the past. Rich: Right, and that’s one of the beautiful things in the past about email marketing, if you outgrow MailChimp you can just take your list with you. So I was just curious to see what that might look like as well. Steve: I have not migrated yet, but supposedly there is a way to do it. Rich: Now how often are you sending out these messages, and I know that Facebook has rules against promotion and all this sort of stuff. How do you manage that? Steve: Yeah, so I always lead with content. Whenever I do a broadcast – I just sent one out today – I just wrote an article that enumerates all of Amazon’s fees so you don’t get stuck and you can take this into account in your probability calculations. I say, “Would you like to see the post?” And as soon as they click ‘yes’, I give a link to the post and say, “Here’s a link to the post. By the way, the tickets to my annual e-commerce conference are about to sell out and there’s only a handful of tickets left. Come buy your ticket now.” And then I have 2 buttons down there, one is for the post and one is to the conference. Rich: And just so people understand, there’s a 24 hour window or something that Facebook implements that if someone engages with you you can promote to them for 24 hours, and then it’s got to go back to informational. Steve: That is correct. And then after that you get one follow up message to those people that you can talk about promotional stuff as well. Rich: Ok. And so you really kind of have to strike while the iron is hot, which is part of the reason why you’re doing that as well. Do you find that having two calls to action – and I don’t know if you’ve played around with this – increases or decreases the click through rates? Steve: It absolutely does. In fact, if your primary purpose is to just get someone to the post, I would actually just put the link on the first message. Rich: And then follow up the next day or within 24 hours? Steve: That is correct, yeah. It just so happens that I was trying to sell some more tickets to my event, that is why I structured it that way. Rich: It’s fascinating, though. Now is there a Facebook regulator who’s reading these messages – certainly they’re checking our ads before they get published –but is there somebody out there that says you kind of went too far into the land of promotion? Steve: So I don’t know if anyone knows exactly how it works, but here’s how I suspect it works. If you send out a message that has a higher than normal close rate, or a complaint rate, then that’s when they’re going to send someone in to investigate. So I’ve actually had my Messenger account suspended last year, which is why I got a lot more careful. There’s kind of this gray area. So I’ll tell you about the message that got me suspended, “I just started a new platform that will help you grow your email list for free. Would you like to learn more?” And as soon as they click on ‘yes’ I give them the additional information. But it turns out that that broadcast – and I don’t know if a lot of people complained about that one – but I think Facebook felt that was promotional and they suspended me. I had to reapply, appeal, tell them that I would never do that again, and that was that. Rich: But still, it stopped you from being able to contact your people and it’s obviously a headache. So good to know in terms of what we can and can’t do. And I’m curious, maybe it was the word free, maybe it was just the fact that you got closes or complaints and that got them to put a human being on that to deal with it. Steve: I mean it’s kind of scary. You can lose all of your account just like that. So that’s why now I’m actually extra, extra careful what I send out. Rich: Right. So what other lessons have you learned – painfully, that last one – or what other tips do you have for people who are just kind of getting started with Facebook Messenger? Steve: I would say that even if you aren’t 100% on board with the platform yet – and it does take a little bit of convincing since it’s new – go ahead and sign up and just start gathering subscribers. I think ManyChat has a free tier where you can gather as many subscribers as you want and they won’t charge you at all. Whether or not you want send to them you can decide that in the future, but I would start gathering them now. And I would argue, remember that comment when I said that marketers might trash this platform going forward, right now I feel like not a whole lot of people are adopting it so that the open rates and lick through rates are amazingly high right now. But I suspect over time, just like email, that will gradually decline. Rich: I completely agree and I’m kicking myself because two Social Medial Marketing World’s ago Mike Stelzner said this was going to be the next big thing and we’ve only got one person talking about it this year. Last year I went back and thought this is the year I dive deep into Facebook chat Messengers, and they had three speakers on it. And this year they’ve got like 15 people speaking on it. So I’m like, Rich, what is it going to take for you to actually do something with your Facebook Messenger bot. I even got on a platforms, I just haven’t done anything with it yet. So I need to jump on that. You work with a lot of different people, you talk to a lot of people. Are there any other ways that people are using Facebook Messenger that you think are creative and new? Steve: Yeah. I mean my colleagues and I, we kind of compare notes and I just kind of take the best of both worlds of what I see. I can get a little bit more specific on some of the other things that I’m using, or if you’d like, on the e-commerce end. Rich: Yeah, give us a couple of things that you’re doing that you found to be effective. Like, I’m curious about photos and videos and different things, so I’m curious what your experience has been. Steve: Yeah. So at a base level – and I actually started delivering receipts via Messenger for my store – so whenever someone makes a purchase I give them a receipt in Messenger. And what’s nice about that is it’s a very non-obtrusive way to get them on your Messenger list and to expect future Messengers from you. So that’s one thing that I do. And as soon as they opt in they are now a customer in my database. So let’s say they haven’t made a purchase in 6 months after they made that initial purchase, I can send them a note automatically with a coupon that tells them to just come back and give our store another try. We also sell wedding handkerchiefs in our store. Rich: Would that be the one follow-up you’d make, Steve? Steve: That is correct. That would be the one follow-up. Another thing that we do now is since we’re in the wedding industry, as soon as 1 year has passed, we can now message them and say, “Hey, just a reminder that it’s your wedding anniversary, would you like to buy a gift to celebrate that?” Stuff like that. Steve: In the blog land – which is my e-commerce course, that sort of thing – I have just been kind of hedging my bets a little bit. On the email end I have this auto responder sequence and I try to get those email people on Messenger. And those people that are on Messenger I try to bring them back to email. And the way I do that is in between certain messages, just to give you an example, I might do a tutorial – which I deliver via email – but if you want the slides you have to click on a link that will take you to Messenger and you get the slides. Likewise in Messenger land, I’ll have some sort of bonus as they’re going through their auto responder sequence that they have to give their email in order to get that extra piece of content. So I’m just kind of hedging my bets here because I don’t want to depend on Messenger. Ever since I got suspended I got really paranoid that I could just lose everything. So that’s why I’ve been moving people over, and my email click through rates have been declining the last 5 years and so I wanted to move some of those people over to Messenger. Rich: It makes sense to have multiple ways of reaching the same people. And the bottom line is that you don’t want to put all your eggs in one basket anyway. Steve: That is absolutely true. The reason why I bring that up is because there are some people that are so gung ho on Facebook Messenger bots that that is their primary vehicle now. They don’t even try to go for the email thing. So I don’t agree with that at all. Rich: No. Those are probably the same people that said you don’t need a website anymore you can just have a Facebook page. And we don’t know what happened to those people because they all disappeared. Steve: All it takes is one suspension to set your bearings straight. Rich: Right. And we’ve all been accused of somebody saying that we did something wrong and then you have to appeal it and it turns out that you didn’t do anything wrong. It’s a waste of time and energy, and you definitely don’t want to be reliant on Facebook for all of your customer acquisition or access, for that matter. Steve: Yeah. Here’s some creative ways actually that my colleagues are using Messenger bots that don’t apply to my store. For example I have this buddy who’s running a skincare company. So he actually uses the bot to get an idea of the skin type of the potential customer, and then they provide specific product recommendations based on the answers they gave. I think that was brilliant. Rich: Interesting. Yeah, that’s pretty cool. Steve: So it just depends on whether it’s applicable to what you’re trying to do or not. For example for my blog I might be able to use a bot up front to ask them if they’re interested in selling on Amazon, eBay, or their online store up front, and then deliver them personalized content after that. Rich: There’s a lot of opportunity here. I’m getting a feeling that you can start off and keep things really simple, and then as you get more comfortable with the platform, start to come up with something really creative uses of Messenger. Steve: That’s correct. And what’s also nice is you can incorporate video in these steps too, if you want to be even more personalized during the messaging. Rich: Very cool. I can’t wait until I can create some videos that will automatically splice me so that it will sound like I’m talking to the person. Something right out of Westworld. Alright Steve, as always you are one of the smartest people I know and a very clever marketer. I love what you’re doing with this. I know a lot of people ae going to want to check out some of those sites again, so why don’t you tell us where we can find you online. Steve: The easiest way to find me is over at mywifequitherjob.com. Over there is a contact form if you want to get ahold of me there. If you’re getting married or if you want some linens, I can hook you up over there at bumblebeelinens.com. And I run an annual event just like you do, Rich. It’s called the Seller Summit, it’s geared towards people who are selling physical products online, and that occurs once a year, over at sellersummit.com. Rich: Fantastic. Steve, thanks so much for stopping by again, and I’ll see you out in San Diego soon. Steve: Thanks for having me, Rich. Steve Chou has found creative ways to effectively market to his various audiences, while simultaneously cross marketing with email and increasing his open rates. Find out his secrets by listening to his podcast, or consider attending his conference aimed at those in the e-commerce space.